2012’s 21 Jump Street was juvenile, crass, vulgar, patronising, stupid, misogynistic, irritating, and seldom amusing. It also did inexplicably well at the box office. So what could one have expected from a sequel? Well, more of the same really. 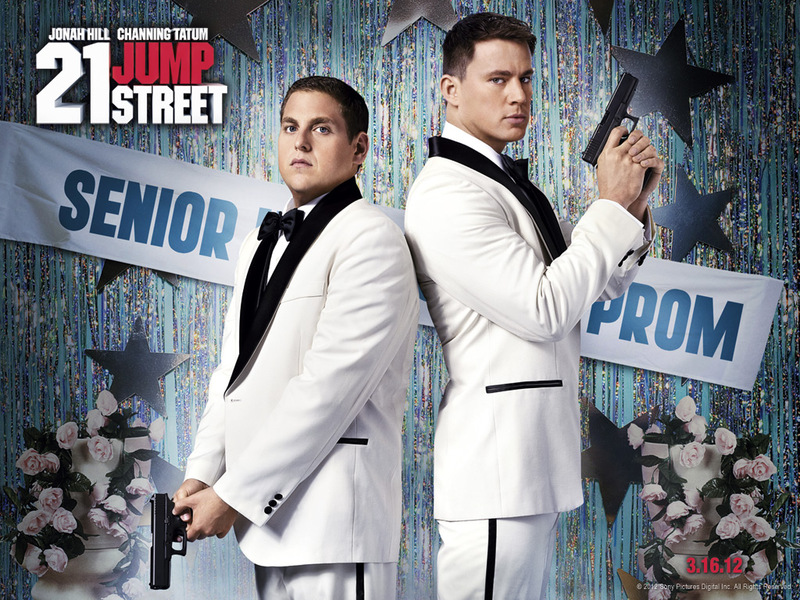 Jenko (Channing Tatum) and Schmidt (Jonah Hill) arrive at college to unearth who is behind the drugs operation there. 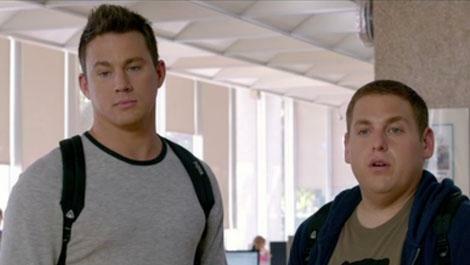 22 Jump Street is a comedy that is a carbon copy of its prequel. But this time, Schmidt (Jonah Hill) and Jenko (Channing Tatum) are not sent back to high school by Ice Cube to bust a drugs operation (as if anyone believed that Channing Tatum and Jonah Hill were high school students); they are sent to college. 22 Jump Street employs exactly the same plot as well as the same juvenile, crass and stupid humour as its prequel. However, this time, audiences are prepared for the movie’s utter inanity and so won’t be (unpleasantly) surprised by it. Also, the film has a surprisingly good climax and the ending scene(s) of the film are probably the funniest bits of the movie (which says something about the rest of it). That is not to say that one won’t laugh during the film. 22 Jump Street continuously mocks itself (and several superhero movies at the same time) by explicitly confessing that it is a sequel devoid of ideas (unlike so many other sequels that are equally devoid of ideas, only they refuse to admit it). Nevertheless, by 22 Jump Street stating that it is ripping itself off, viewers are likely to loosen their guards at an early stage. This means they’re likely to laugh a few more times than they thought they might have done prior to seeing the film. Schmidt meets the nice Maya (Amber Stevens) who does little in the film other than smile and look pretty. Of the rest of the cast, Ice Cube again spends his entire time on screen shouting and swearing (because shouting and swearing per se is funny, right?). Amber Stevens is merely there to be eye candy; Wyatt Russell is solely there to be the third wheel in a bromance love triangle that quickly grates on the nerves; and Dave Franco and Rob Riggle make cameo appearances (to add fifteen minutes onto the film’s running time and) so audiences can be reminded of what these two (idiots) did in the first film (just in case viewers have suffered amnesia in the last two years). Jenko getting drunk at a party, whilst striking up a friendship with his American football team-mate, Zook (Wyatt Russell), much to Schmidt’s jealousy. Otherwise, the music used throughout the film feels random and oddly timed, if not out of place. But, hey, 22 Jump Street is a comedy that has little discipline, sense of timing or intelligence, so why should the music be any different? All-in-all, 22 Jump Street is certainly as juvenile, crass, patronising, stupid and irritating as its prequel. But it is less vulgar and misogynistic, plus a little funnier than 21 Jump Street. Undoubtedly, this is because of 22 Jump Street’s self-derision; because audiences have become used to the film’s sense of humour (if one can call it that); and because viewers have somehow come to like the two central characters for the fools they are. Jenko (Channing Tatum) bullying Schmidt (Jonah Hill) in their high school days. They did not get on at all whilst they were in the same class. 21 Jump Street is loosely based on the 1987-91 TV series with the same title, which starred a young and then-little known Johnny Depp. 21 Jump Street is about two very dissimilar 1980s former high school classmates. Jenko (Channing Tatum – The Eagle, The Vow, Side Effects) was the well-liked, yet brainless jock, whilst Schmidt (Jonah Hill – Superbad, Moneyball, The Wolf of Wall Street) was the smart, but unpopular nerd. Despite their differences, Jenko and Schmidt quickly become friends after enrolling in the police academy. Once they finish their course, they become partners on patrol. However, Jenko and Schmidt are hopeless at their jobs. 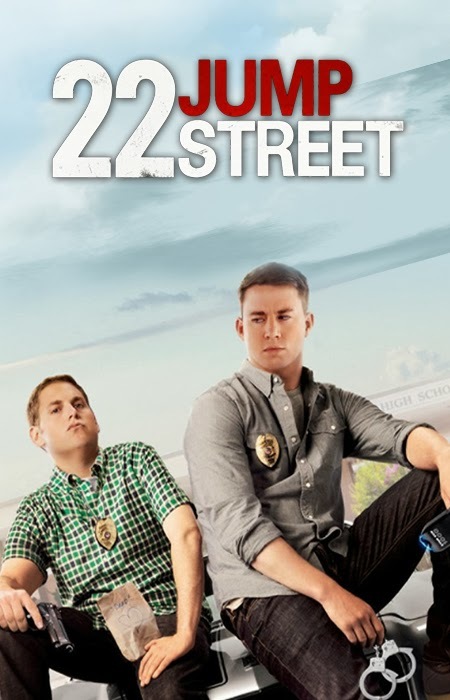 Subsequently, they are sent to an undercover unit, located on 21 Jump Street. It is there that they’re ordered by their new superior, Captain Dickson (Ice Cube – Ghosts of Mars, XXX2, Rampart), to discover who is behind a drug network that is allegedly based in their former high school. So Jenko and Schmidt go back to their old stomping plain (to find, to their shock, that what was popular in the late-1980s is not anymore), posing as students, to bust the drug dealership before it spreads to other schools. The plot for 21 Jump Street is simple as well as amusing on a couple of occasions. In addition, the friendship between Jenko and Schmidt keeps viewers interested, due to the chemistry that the two actors share; and the shoot-out scenes are a good laugh and surprisingly gory as well. Schmidt and Jenko, now friends and cops, apparently dressed as teenagers before going undercover into their old high school. Captain Dickson (Ice Cube) ordering them not to get with any school-girls or teachers. Yet, there are fewer action scenes than one would have predicted; and, alas, the overwhelming majority of the humour revolves round repetitive, mindless jokes between the two main characters; swearing; and vulgarity. Of course all of this can be tolerable and hilarious in moderation. But the directors, Phil Lord and Chris Miller (Cloudy With A Chance Of Meatballs), have taken it all (shamefully) to the point when even the crude Steven Stifler (played by Sean William Scott in the American Pie series) might call a halt. Combined with such coarseness in 21 Jump Street are the performances of Channing Tatum and Jonah Hill as Jenko and Schmidt, respectively. The pathetic and overly immature nature of their attempts to behave in a ‘high school manner’ is embarrassingly terrible. Compared to them, Jay Cartwright (played by James Buckley in The Inbetweeners TV series and movie) is a relative grown up! Both Tatum and Hill can do better than this, as the former demonstrated in Coach Carter, and the latter in Superbad and Moneyball. The poverty of the acting in 21 Jump Street is not Tatum’s and Hill’s alone. Ice Cube; Dave Franco (Superbad, Fright Night, Warm Bodies), playing as Eric, the ‘cool-guy’ of the school; and Brie Larson (Scott Pilgrim vs. 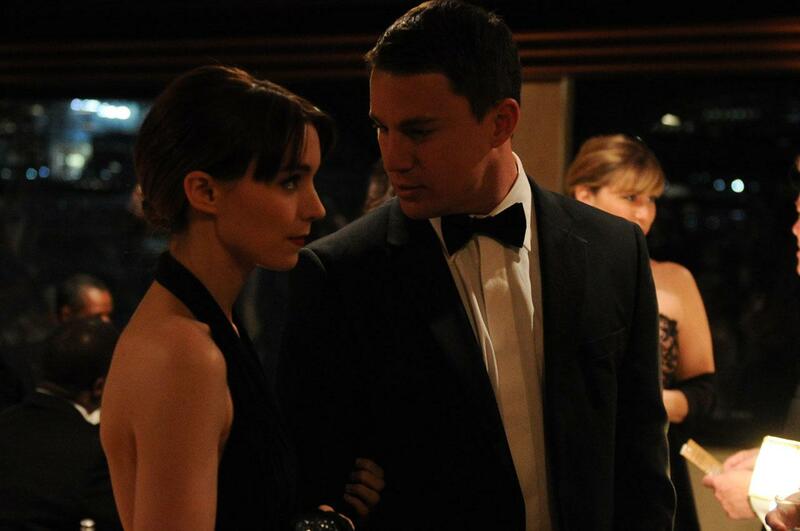 The World, Rampart, Relanxious), playing as Schmidt’s love interest, are all insipid and far from funny. The only noteworthy performer is Johnny Depp (Pirates of the Caribbean I-IV, The Tourist, Transcendence), who makes a surprise cameo appearance as his old character, DEA Tom Hanson. That was a clever move by the directors to bring him in. With the film dragging on for a hundred and ten minutes, Depp gives the movie some much needed unpredictability and impetus. 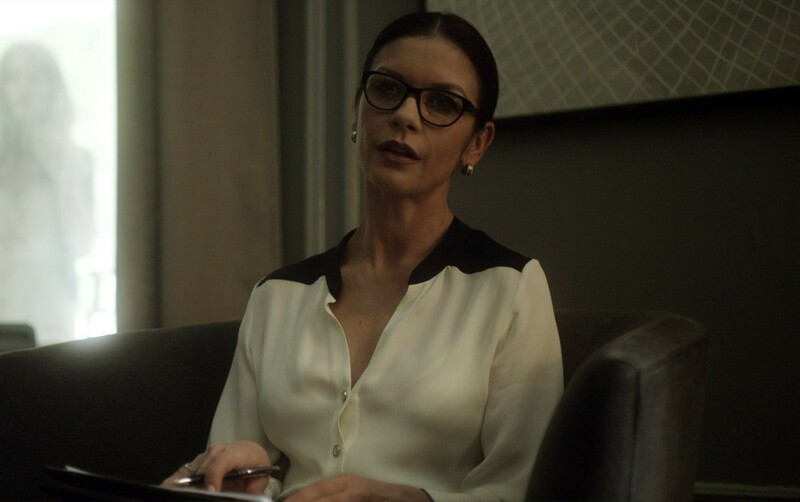 Likewise, it was intelligent of Lord and Miller to alter the dynamics of Jenko’s and Schmidt’s former high school. 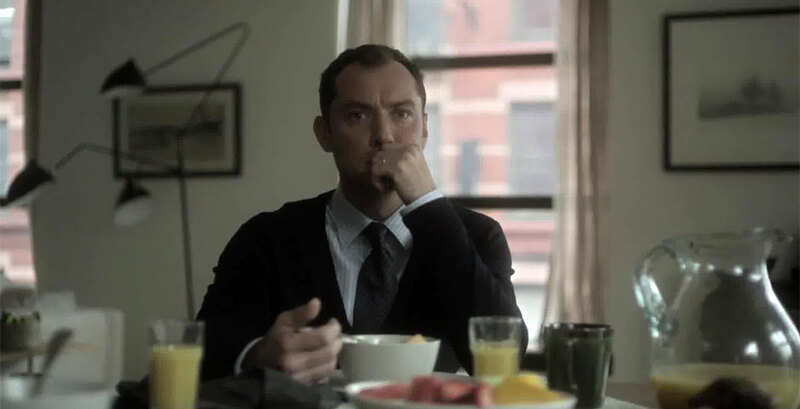 This entailed that the two main characters had to adapt to virtually new surroundings, which could have given Jenko and Schmidt another dimension to their, otherwise, shallow personalities. 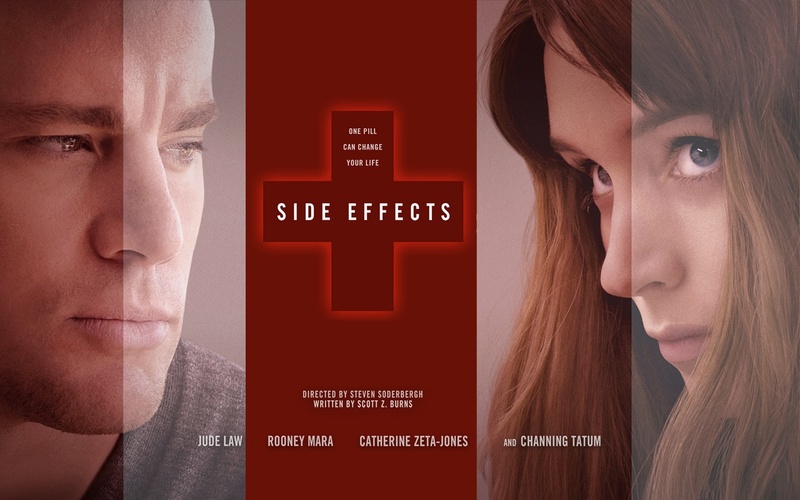 Schmidt sitting with Molly (Brie Larson), the object of his fascination, as he tries to find a breakthrough and unearth who the drug suppliers are. Yet, the directors badly under-developed these because they give little feel for how the school has changed. Worse, viewers are likely to ascertain almost no appreciation for this particular school or the American high school environment in general; especially, if one compares 21 Jump Street to the excellent Saved By The Bell series, or even the ‘chick flicks’ Mean Girls and John Tucker Must Die. All of those illustrated the different (albeit stereotypical) cliques, and the types of personalities within those cliques, that tend to exist in American high schools. But 21 Jump Street has almost none of it to the detriment of the movie. 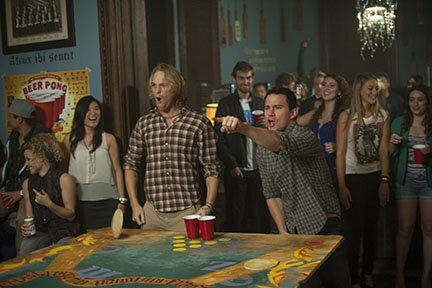 Over-all, 21 Jump Street is a light-hearted film with two likeable main actors, who play daftly below their capabilities. The movie has a handful of laughable moments, but they’re overshadowed by the incessant obscene crudity that ruined ‘comedies’ like Due Date and The Hangover: Part II. Neither of those films made audiences cry with laughter as much, or as often as The Inbetweeners Movie. The same can be said for 21 Jump Street. Since Gladiator, there have been many classical-era or medieval based films. All have tried to repeat the success of Ridley Scott’s masterpiece and most of them, if not all of them, have failed. For those who like the genre, The Eagle might be quite an entertaining movie. But like King Arthur, The Kingdom of Heaven and Robin Hood, it is not in the same league as Gladiator. 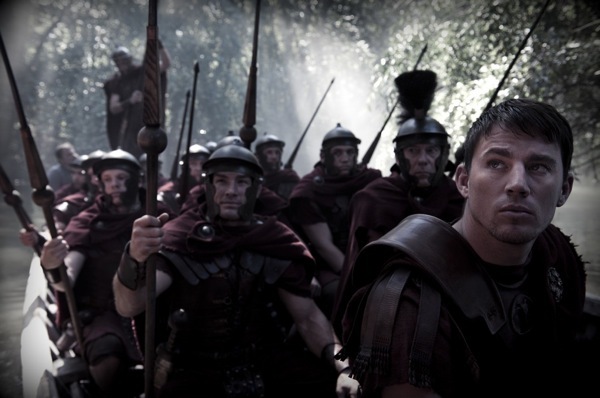 Marcus, played by Channing Tatum, leading a Roman legion to the garrison in northern Britain. The Eagleis based in Roman Britain in 140 AD. In 120 AD, the Ninth legion, led by Flavius Aquila, lost the eagle, a military insignia of Roman rule, during an invasion north of Hadrian’s Wall (modern-day Scotland). The legion disappeared without trace as did the eagle. 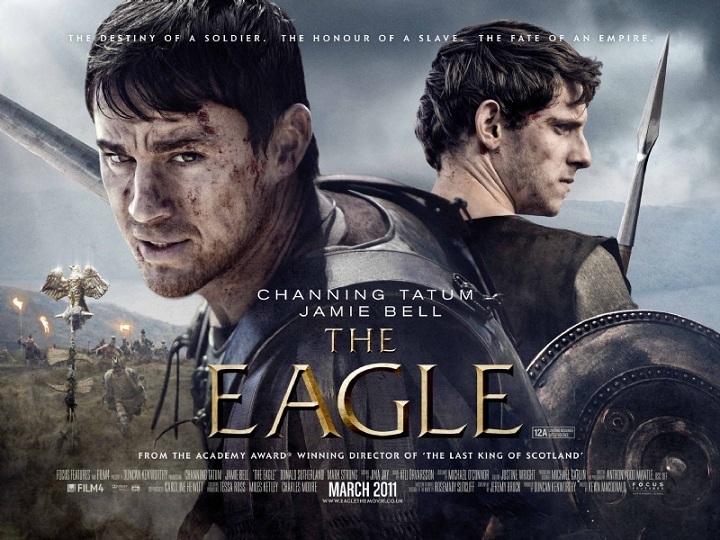 Twenty years later, Marcus Flavius Aquila (Channing Tatum – Step Up 2: The Streets, Dear John, 21 Jump Street), the son of Flavius, is a commander of Roman soldiers in England until he is given an honourable discharge due to wounds sustained in battle. Whilst staying at the villa of his uncle Aquila (Donald Sutherland – The Italian Job, Pride & Prejudice, The Hunger Games), Marcus hears a rumour that the eagle has been seen north of the wall and is with the blue-faced Seal tribe. Despite his uncle’s warnings that no Roman can survive north of the wall, Marcus is determined to find the eagle and resurrect his family name. Taking his slave, Esca (Jamie Bell – Billy Elliot, Flags of Our Fathers, Defiance), Marcus travels north, entering unchartered and highly dangerous territory. 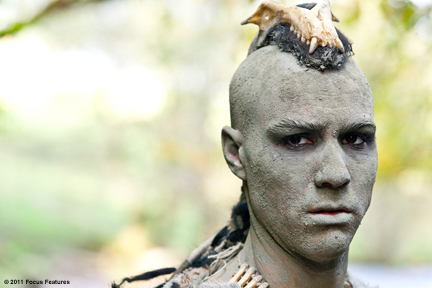 The lead warrior of the Seal tribe, played by Tahar Rahim. Otherwise, not much of the spirit of Rome, and what the empire stood for at the time, is captured in this movie; save for the elites having slaves and living in fancy villas. Moreover, the choreography of the film is not great as scenes do not slot in nicely one after the other. Also, the director, Kevin Macdonald (State of Play, The Last King of Scotland), has let his viewers down vis-à-vis the cinematography. Scotland has many picturesque sights that Macdonald could have chosen; yet, the landscapes adopted throughout the film do not look remotely awe-inspiring. Rather, they look like a background screen of any old scenery. In short, The Eagle might be enjoyable for classical-era movie lovers; but it is nonetheless a poor film in more or less all respects. Thus, eleven years since its release it still looks like Gladiator has no rival.